Don’t miss free live music in the Cinnabar with Maw Band playing acoustically driven funk on Friday, February 9th and Saturday, February 10th from 3:30 pm- 6:00 pm! See all Cinnabar aprés music events here. Growing up during the rise of the hip-hop era, introduced to DMB and the acoustic guitar at the age of 21. Maw Band combines the rhythm and flow from early rap artists such as 2-Pac and Bone Thugs with the sounds influenced from artists such as Slightly Stoopid, Dave Matthews, Jack Johnson and many other acoustic driven rock artists. With a passion for poetry turned to melody’s, Maw Band creates head bobbing music with influential lyrics! Playing over 100 shows a year and gaining speed as a band attracting fans where ever they stop, they have toured with Ziggy Marley, Cheap Trick, Rusted Root and shared the stage with many other artists including Eve 6, Robert Walter, Reckless Kelly, Young Dubliners and many more. 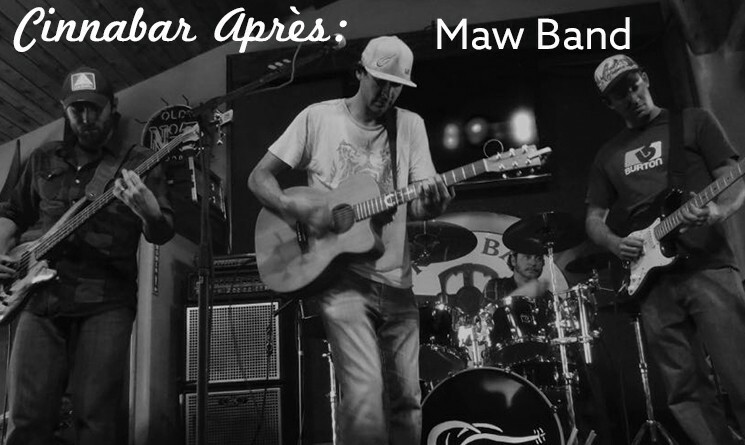 Maw Band is shaped by the sounds of Drummer - Eli Preston, Bassist -Brad Corbin, Guitar -Thomas Farwell, Guitar & Vocal - Brian Maw. Catch the new groove!